Last fall, thousands and thousands of Amerikans, primarily youth, rallied to the call to Occupy Wall Street, which evolved into Occupy Everywhere — a rather frightening slogan for the youth of the number one imperial power to take up. More progressive, and often more experienced, poles in the movement steered things in an anti-occupation/anti-colonial direction. But somehow this wasn't as appealing to the Amerikan youth as rallying for more jobs, free schooling and better interest rates on loans. If we eliminate the flow of wealth from the neo-colonies, the people in this country will lose their high paying jobs and easy lines of credit. In practice we see lines being drawn, as the more radical messages seem to accompany some tactics that trigger anger from the Amerikan "middle class." There continues to be backlash in some instances of calling those who vandalize property "terrorists" while telling them to target bank windows rather than their nice neighborhood. We have little interest in the petty bourgeois debate over what is okay to smash, but this whole debate serves as a convenient excuse for the Amerikan left to ally with the imperialist state. What needs to be challenged is the idea that the Amerikan "middle class" somehow deserves more than everyone else in the world and therefore is not the enemy like those evil bankers. Interestingly, the bourgeoisie gets away with attacking those who act against the interests of the "middle class" as "outside agitators" and "spoiled white kids." This name calling serves as a distraction from the issues being demonstrated around. Of course there will be anti-colonial struggle in white faces in a white country. To argue otherwise is to breed confusion. 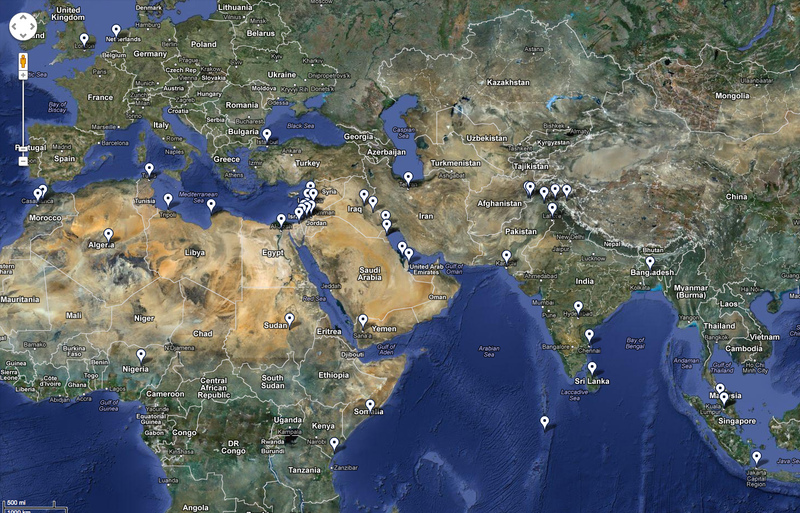 While we believe there is more anti-imperialist potential here in the United $tates than those who showed up this weekend, particularly among the internal semi-colonies who were sparsely represented at these events, the dominant ideology of this country is pro-middle class, which is pro-imperialism. Even the most radical Black organizations out here will say that "white people are exploited too." Yet the truth is the complete opposite: Black people aren't exploited either in this country. The sooner we all start being accountable for what we have, the sooner we can take a realistic approach to what we can do about it. We need a strong line that says, yes, the petty bourgeoisie and the labor aristocracy in this country are the enemy of the world's people. Just as MIM has always attacked identity politics, this does not mean that petty bourgeois people cannot be anti-imperialists. 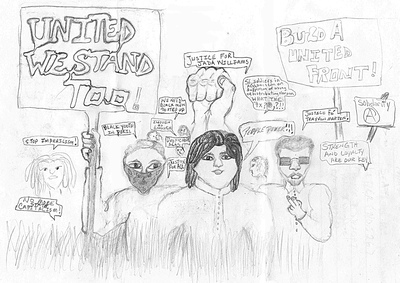 We welcome and honor those Amerikans who choose to stand with the exploited peoples of the Third World. But let's make it clear that doing so requires opposing your own class interests. We do not believe that moralizing will "wake up" the Amerikan people and end this system of exploitation. We recognize there is no winning the majority in this country. So it is a question of recruiting the minority that care or suffer greatly under this system and promoting disunity among the rest. Finding effective tactics for either is our challenge. 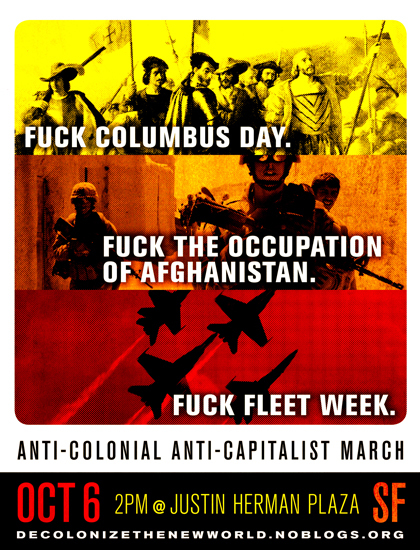 Before we split the anti-imperialist camp over what we should do after the revolution (where we differ with the anarchist majority at this weekend's events), let's split with those who will organize and fight for the deepening exploitation of the Third World to feed the over-consumptive, privileged lifestyles in the imperialist countries. And let us be honest with our fellow exploiters, breaking the illusions of an alliance between First World social democracy and the interests of the exploited and oppressed. The one cannot exist without the other. The clearer we are about that, the more Amerikans are forced to make the choice between committing daily violence through their privilege and becoming a virus within the matrix. North Carolina's so-called Department of Public Safety has joined a number of state agencies in openly sabotaging efforts to prevent prisoners from fighting in their facilities. 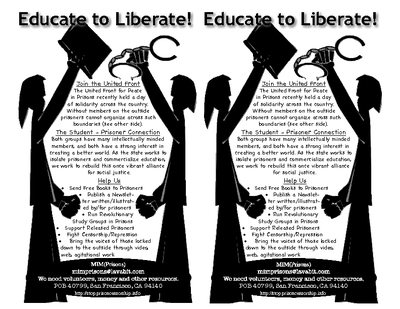 MIM(Prisons) and our readers in North Carolina have received multiple notices of censorship of Under Lock & Key 27, most of them citing page 3, which contained the Call for Solidarity Demonstration on September 9. In their doublespeak, they justify this with reasons such as that it promotes "violence, disorder, insurrection or terrorist/gang activities" and that it "encourages insurrection and disorder." This was in reference to a call for 24 hours with no eating, working or fighting, where prisoners only engaged in solidarity actions and networking to build peace. Many other states censored Under Lock & Key 27 for threatening the security of the institution (including New York, California, Wisconsin, and Illinois). Wisconsin Department of Corrections later claimed that ULK 27 "teaches or advocates violence and presents a clear and present danger to institutional security." So there you have it. Prisoners coming together, for whatever cause, is a security threat to them. Making it clear what they are trying to secure, which is the prevention of the self-determination of the oppressed nation lumpen. This has nothing to do with the persynal safety of humyn beings, which the Call for September 9 was clear in promoting. Folsom State Prison in California went so far as to say that ULK 27 was censored for "advocating civil disobedience in prisons." Even this claim is a stretch, unless fasting and not working for a day, a Sunday no less, is disobeying the law in some way. Texas seems to think so, as they censored many copies of ULK 27 with the consistent reason that it "advocates hunger strike and work stoppage." Well we know Texas is big on unpaid labor in their prisons. And we suppose it's not breaking news that peaceful civil disobedience is a crime in the eyes of the state of California. Despite the more honest justifications given by some state employees in California and Texas, safety and security concerns remain the number one reason given by states to censor MIM(Prisons)'s mail to prisoners. 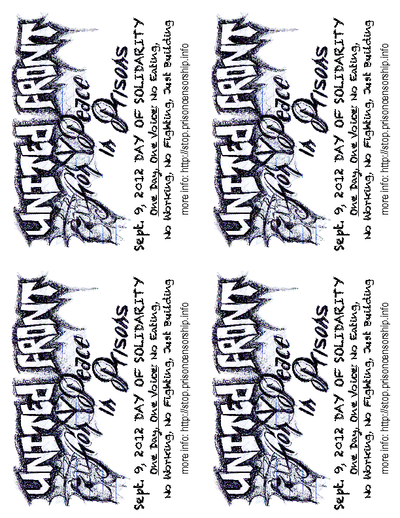 To call these agencies on their bluff, MIM(Prisons) proposes that organizations within the United Front for Peace who are working to build off of September 9 focus on promoting safety in their agitational and organizational work. From the countless painful letters we get from U.$. prisoners who fear for their life everyday in these places, we are pretty sure that working together we can do a better job of creating a safe environment than they can. Comrades should brainstorm ideas of how to launch a campaign to change the conditions that the state creates that lead to unsafe conditions for prisoners. Often unsafe conditions for prisoners are potentially unsafe for staff as well. Either way, an effective campaign to make prisoners safer should bring around new recruits. Can we get enough stories of comrades working to help each other out and improve each other's well-being to make ULK 29 an issue focused on creating safer prisons in the U.$? And you artists out there, any ideas on how to promote issues of safety and security that speak to the prison masses? Let's see what we can do with this. And look out for each other in there. Let's start with Rosenfeld's political worldview, because we know no journalist is truly unbiased. Rosenfeld's opinion on liberation struggles is revealed in his characterization of the Third World Liberation Front (TWLF), that Aoki organized in, as a violent student movement. (2) He blames the violence of the 1968-69 strikes of the TWLF on Bay Area college campuses on the strikers themselves, not the pigs. Yet the students did not initiate violence, and in fact were sprayed with so much teargas by the pigs that the trees in Sproul Plaza on the University of California at Berkeley campus were still irritating students' eyes even into the following school year. Coming from this perspective we must question Rosenfeld's assessment of the FBI right off the bat. Influencing the Party greatly from its beginning, Richard Aoki is most famous for supplying the BPP with their first guns. According to his biography, Aoki helped shape the early ideology of the Panthers through his relationship with Bobby Seale and Huey Newton at Merritt College by suggesting reading material and engaging with them in political debate. (3) Besides his work with the BPP, Richard Aoki also did much organizing and protest work with the Third World Liberation Front via the Asian American Political Alliance. Aoki remained politically active and revolutionary-minded even until his death in 2009. Surprisingly, Rosenfeld is from San Francisco and has been doing research for this book since 1982, yet it wasn't until 2002 or 2003 that he learned of Richard Aoki. Understandably, Rosenfeld's claim has sparked a lot of debate on the internet and radio as to whether it is true or not. While we are open to the possibility of nearly anyone being an agent of the state, MIM(Prisons) agrees with those who have held out for clear proof before we will consider denouncing Aoki's legacy of the state. Objectively, the current evidence supporting this claim is inconclusive at best. The original article was highly sensational, focusing on vague, chopped up, and misquoted sound-bites of a 2007 interview with Aoki that the author interprets as admissions of guilt. Besides these sound-bites, the only other evidence offered are ambiguous FBI documents, citing Aoki as providing "unique" information not available from any other source, and the testimony of former FBI agents, of whom the only one that supposedly knew Aoki is also dead. (4) Yet none of the documents say what information Aoki supposedly gave the FBI; it has all been redacted. On the radio program APEX Express, Harvey Dong, a close friend of Richard Aoki, offered the listener a thorough reading of the relevant parts of the FBI documents cited by Rosenfeld (as well as excerpts from Aoki's college term papers). (2) The only information which allegedly came from Aoki in the first set of FBI documents is about Aoki himself and could have been obtained using a wiretap (or informant) on Aoki. 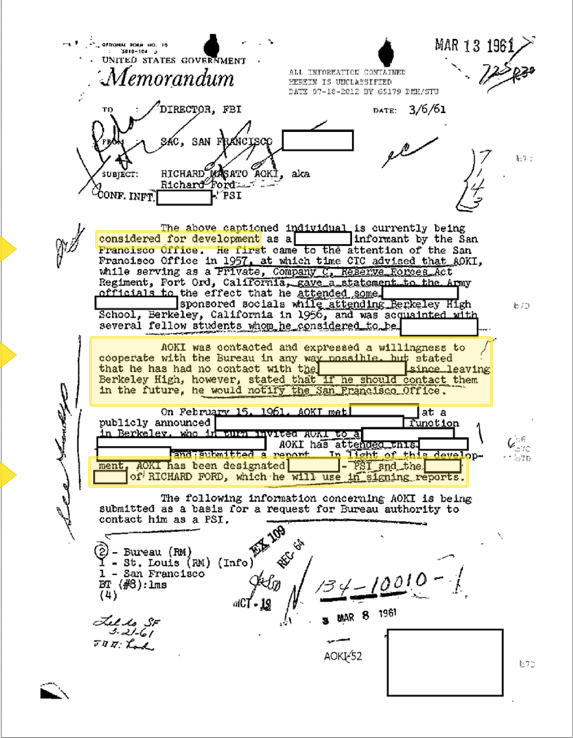 Assuming the released FBI documents are real, the set released on September 7 does establish that Aoki was giving information to the FBI from 1961 to 1977, but very little about that relationship is revealed. documenting his role as an informant for the Bureau. The fact that the FBI redacts all names of individuals and organizations that Aoki allegedly provided information on makes it impossible to speculate on the nature of his interactions with the Bureau. Rosenfeld's follow-up article pulls many quotes from the 221 pages of documents indicating that Aoki provided valuable information, but any details that might substantiate these statements are redacted or absent. Despite this release of new documents, there is still no information on what intelligence he allegedly gave to the FBI on the BPP or other groups. While we should always be prepared for the possibility that a trusted comrade is an agent, we need to see evidence of harm done to the movement to condemn someone who did so much to advance the cause. It is very conceivable that the FBI is snitch-jacketing Aoki to discredit his work as a Third Worldist revolutionary activist, discredit the Panthers as pawns of the FBI, and more simply to sell copies of Rosenthal's new book. 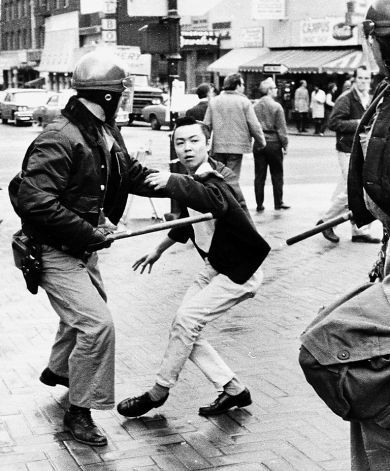 One of the lessons we learned from the Panthers, and other political movements of the 1960s, is the importance of security. The COINTELPRO attacks on the Panthers led MIM to develop as a semi-underground organization that keeps comrades at arm's length, centering around political, rather than persynal, relationships. Interestingly, on 20 August the FBI had yet to release about 4,000 pages of documents on Richard Aoki, and was claiming to have no main file on Aoki himself. This cannot be true considering how politically active and outspoken he was. 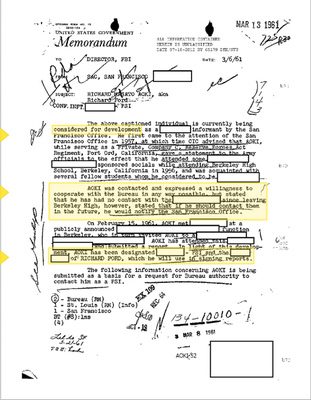 Rosenfeld and others saw the FBI withholding these documents as indicative of Aoki's status as an informant, assuming these were reports given by Aoki. (4) Then supposedly some time between 20 August and 7 September, the FBI released at least 221 pages of documentation just on Richard Aoki. With all the heated debate, we note that the FBI chose a very opportunistic time to release these documents, which causes us to further question their legitimacy. Why would the FBI release documentation that says Aoki didn't provide valuable information? This controversy is feeding right into their agenda to undermine revolutionary activists and movements. This is a lesson we've unfortunately had to learn time and time again. A claim that everyone on SNY or Protective Custody is a snitch, or a rumor on the yard, is not sufficient evidence to call someone out as an agent of the state. Sometimes comrades suggest that we require USW members to submit their files from the Department of Corrections to determine whether they are compromised in any way based on charges, and where they've been housed in the past. They tell us we should ask the state who we should let into USW. Not only is this ridiculous in theory, but we know of at least one case where an informant was given doctored files and released back onto general population to be a Lieutenant in a prominent LO in California. A piece of paper from a government agency should only be considered as one piece of evidence, not the sacrosanct truth. The state is already putting a lot of energy into making us suspicious of our fellow revolutionaries; we should not make their job any easier. Instead we should be communicating with each other directly if we suspect unprincipled divisions are being fomented. Our struggle is too important to get caught up in rumor mongering and sectarianism. Even if evidence does eventually come out which proves Aoki was providing the FBI with information that actually helped them attack the liberation struggle, we will still not be devastated. While we don't agree with Fred Ho's subjectivist methodology of defending Aoki overall, we do have unity with his perspective on the consequence of truth in the allegation. "If Aoki was an agent, so what? He surely was a piss-poor one because what he contributed to the movement is enormously greater than anything he could have detracted or derailed. 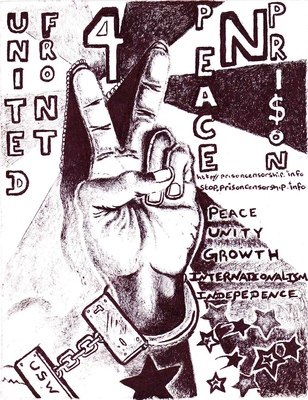 "(6) This view is right in line with our view on how to maintain security within the anti-imperialist prison movement; don't give a pig the opportunity to do more damage than good. 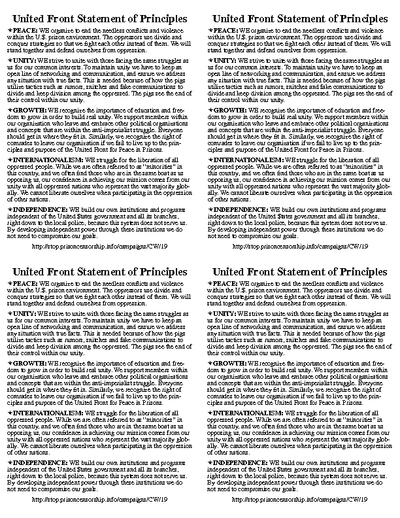 Distributing information on a need-to-know basis and applying high standards to different levels of membership will help ensure people contribute more to the cause than to the enemy.